All his recent concerts had the multi-talented star crooning the high on energy song. As we already know that Farhan Akhtar has been the best performer and he just rocks the floor whenever he gets the opportunity he never misses, this song he must have in his playlist for concerts. Owing to the demand of the audience he includes the song in his song list for concerts, but this song is something which he always wants to keep in his playlist and the audience also loves this a lot. 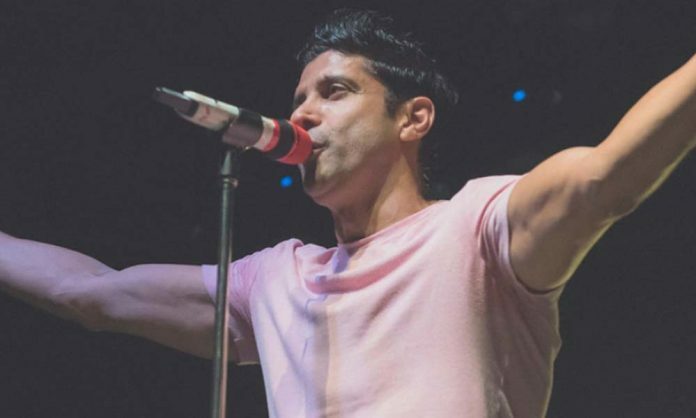 Farhan Akhtar’s concerts are hugely popular with the youth and he receives a tremendous response from his fans for his shows. Farhan has always been a vibrant performer and also the kind of songs he performs to have always been powerful and full of energy that makes the crowd go crazy. The multi-talented star is not just a loved filmmaker and a singer but also a remarkable actor. With Bhag Milkha Bhag Farhan Akhtar established himself as one of the finest performers of Bollywood winning multiple awards for his performance. Farhan Akhtar who often dons the various hats of director, producer, actor and singer has been rocking the rockstar avatar at his recent concerts. On the work front, Farhan Akhtar is currently gearing up for his upcoming ‘The Sky Is Pink’ where the actor will be starring alongside Priyanka Chopra after Dil Dhadakne Do. The multi-talented star will also be presenting Gully Boy next year.